Location: About 20m S of junction with Duke Street. 1835; built as branch of National Provincial Bank, the first national bank to come to Cardiff. Possibly by Edward Haycock, architect, who designed new market buildings at Cardiff at this period. Repairs to stonework suggest upper windows once had architraves and pediments. Two storeyed classical building in ashlar stone. Upper storey (partly patched with cement and some window dressings removed) has five windows. Central, 3-window section has engaged order of 2 Ionic columns in antis with pediment. Single window either side with full entablature and blocking. Small-pane hornless sash windows with hoods for blinds. 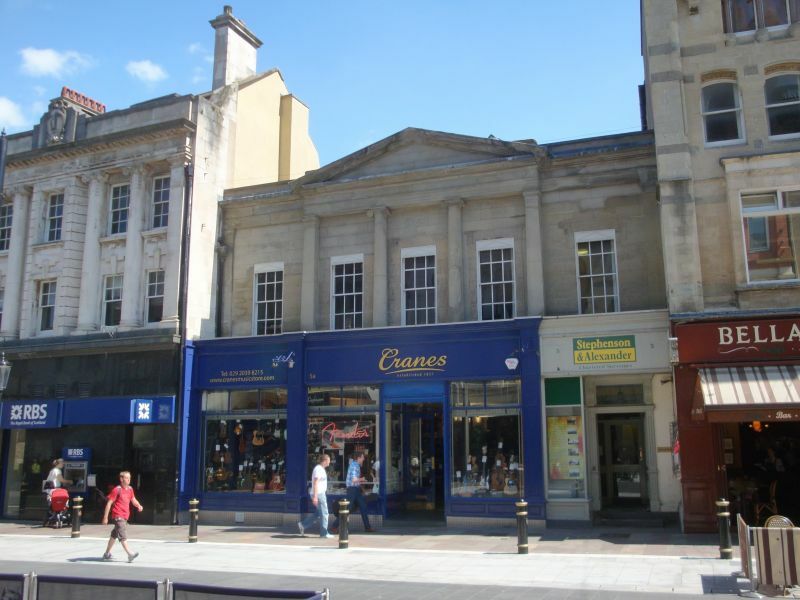 Ground floor set forward and entirely remodelled as shop with modern shopfront in simplified Classical style; to R, entrance to offices above. Elegant early C19 commercial building for the first national bank to come to Cardiff, illustrating emerging economic importance of the town. Part of a mixed, continuous group facing the outer wall of Cardiff Castle; lower building on left adjoins the Duke Street Arcade. Opposite entrance to Castle Arcade.